Yes, if you were caught driving one back in the day you normally say you borrowed it. The car was odd looking back then and my opinion has not changed. 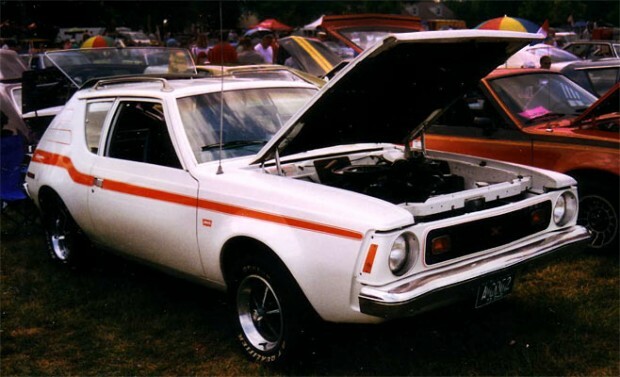 The Amc Gremlin ran from 1970-1978 and was ironically many people’s first car. Most of them came with a six cylinder engine that was peppy, but it was hard to get past the weird looking car. Then, AMC had an idea. What if we tried a purple scheme with a white stripe? Well, it’s still ugly but the color helped. Ok, how about we drop in a big engine? Hmmmmm. Well, they did and the little odd Gremlin that was light as a feather now was smoking more so called hot rods. Believe me, if a Gremlin beat you in a race the shame would last a lifetime. AMC put out quite a few odd looking cars like the Gremlin, Matador and the Pacer. But AMC, before Chrysler took them over decided not to be the laughing stock anymore and decided to take a select few cars and power them with a huge engine to get the last laugh. Cars such as the Hornet, Gremlin and the AMX were fitted with monster engines and the owners would quietly take them to the street and do the damage that was done to them previously. It raised eyebrows and for a brief time got AMC some recognition that they just did not take on a dying Packard and Studebaker car. Now, for a while AMC earned some brownie points. However, it did not last and eventually Chrysler Corporation and the US Government bailed them out and most of the cars were gone. Chrysler really wanted the Jeep line up as it always was a sales winner. Chrysler fazed out everything except the Jeep line that is still a success today. But, some of us remember a brief period when AMC let there hair down and got noticed at the dance. Even if the AMC Gremlin is seen as the least performance car of its era, it still has a place in the history books. Next Story → Dodge Charger R/T 440 From Ben Hill, UK. I can’t believe this was a actual car oh boy! A true sleeper, when they had a big block & a 4 speed. Not a muscle car. Please. People made fun of them take a good look at some of the no style cars of today. Alot look like eggs with Windows.